It feels like there isn't an evening on Twitter without some sort of blogger chat going on, and I can totally see why. 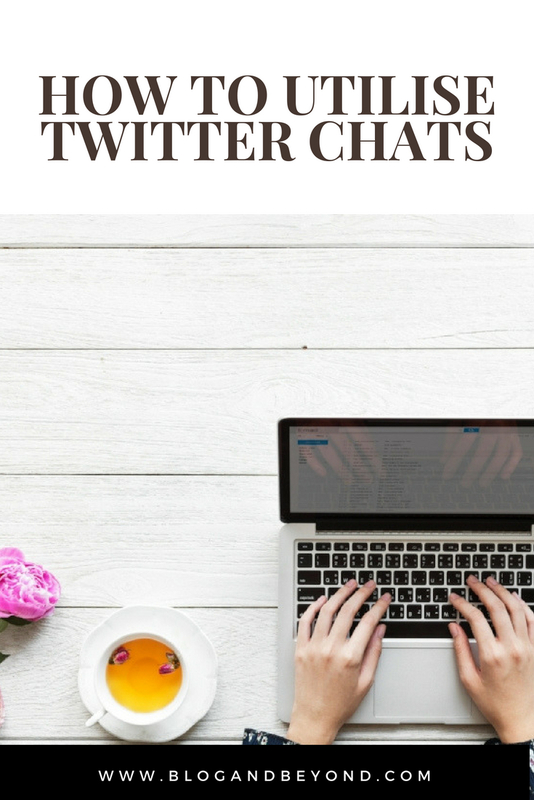 These chats are incredibly useful tools for building your network, and in turn your blog, whilst also being a bit of fun and providing a chance to chat with some new people. Twitter chats happen using one dedicated hashtag and typically cover a specific topic, mostly lasting for an hour. There are hundreds of chats on the go nowadays, and I've shared a few of my favourites at the end of this post in case you fancy trying out some new ones! To join in, all you need to do is tweet about the topic or respond to the question using the hashtag, but you can take it so much further than just a general question and answer. Although I'm a big fan of Tweetdeck for my scheduling, I much prefer to use the actual Twitter website when chatting. This is purely personal preference as I like to be able to refresh the timelines at my own speed, so I like to open pages in new tabs and flick between them as needed. I usually have a tab for my notifications - so I can see who's chatting to me - a tab for the hashtag - so I can keep up with everyone else's tweets - and a tab for the chat host so that I can keep an eye on the questions as they come in. Tweetdeck offers a much more streamlined version of this, as you can choose your columns to show on just one screen as opposed to flipping through individual tabs. It automatically updates these columns in real time, which can also be turned off if you struggle to keep up with it like me. Other useful tools include websites like TweetChat or Tchat - it all just boils down to personal preference. In an ideal world, I'd have a three monitor set up... or maybe four so I can have Netflix on the side too. Now, this is probably the most important part of chats. Interaction is key when getting involved, in fact, it's kind of the whole point. Sure, you can go in and just tweet whatever you want, but if you want to make it work then you need to encourage engagement. This doesn't just apply to your own tweets, because as nice as it is to get a few retweets or a reply, it's also great to build relationships with other people too. Keep an eye on the hashtag and reply to tweets that catch your eye, strike a conversation, follow some new people - it makes a big difference. Try to keep this relationship up after the chat too, maybe head over to their blog and leave a comment on a post you enjoyed, or give them a follow on Instagram. I've found some amazing blogs this way, as well as making a fair few friends along the way too. With hundreds of people getting involved, Twitter chats can get a little bit chaotic at times. Therefore it's pretty important that you follow the rough code of etiquette for chats. It's not really a set of steadfast rules, more guidelines, but it will make a difference both to your chat experience and how others view you. One of the key points in chat etiquette is link dumping. It can be pretty frustrating trying to join in a chat on a topic you feel passionately about when there's someone posting links to their blog every few seconds. Sure, if you have a relevant post to share then do so, but no one wants to crawl through hundreds of "Hey, check out my blog!" tweets when there are GIFs to post and discussions to have. There's more often than not a dedicated time slot to share links at the end of the chat, so save your blog promotion for then. As in the real world, it's important to be polite and respectful when chatting. People will always have different opinions, but if you're clashing with someone on a particular topic then try to approach it in a less abrasive way, or take it to a private communication instead of allowing the world to see your bickering.